Rice Lake, Wisconsin was the site of an Indian Village and wild rice bed from which its name derived. In 1864 Knapp, Stout and Company, a Menomonie logging firm, constructed a storage dam on the Red Cedar River. The lumber business brought the first settlers to Rice Lake. The early pioneers of the Rice Lake area were occasionally served by visiting priests from Chippewa Falls. These early Rice Lake settlers were served as a mission of Our Lady of Lourdes Parish of Dobie. The first priest to offer Mass at the Rice Lake Mission was Father Joseph Dole in 1878. 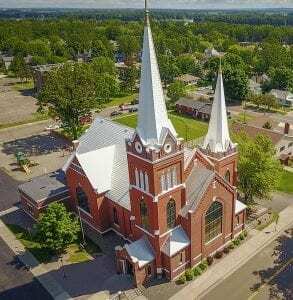 A priest came to Rice Lake from Dobie on Sunday each month to offer Mass in the old city hall, later known as the Odd Fellows Building located on the northwest corner of Main and Messenger Streets. remained only eight months after which St. Joseph Church reverted to a mission of Our Lady of Lourdes until 1889, the year the first rectory was build. At this time there were 125 families in St. Joseph Parish. By 1892 Rice Lake’s population had soared to 2,500. In 1905 it became part of the Diocese of Superior. Those early parishioners saw a need to educate their children in a Catholic environment. In 1890 the first school was built. It was staffed by the Franciscan Sisters of Christian Charity of the Holy Family, Alverno. The four sisters lived in the school basement until the upper part of the school was remodeled for their living quarters. It had four rooms and a basement. In 1902 the first school graduation took place. On March 25, 1908, demolition began on the original church. The cornerstone for our current church building was laid on July 4, 1908. On Thanksgiving Day, November 26, 1908 the new church was dedicated costing $45,000. In 1936 a kitchen and two restrooms were installed in the basement. Exterior renovations were made to the existing structure in 1947. A cement floor was poured in the basement in 1950 so it could be used for a parish hall. There were 600 families in the parish. In 1951 construction started on the new school. It was occupied in October of 1952 and built at a cost of $425,000. In 1963 the entire church exterior was reconditioned and new bells were imported from Holland. As a result of Vatican II, the communion railing was removed and the altar was placed in mid-sanctuary facing the people in 1967. In 1974 two new rooms were built in the south and east corners of the church hall. Major interior and exterior upgrading was done from 1978-1979. This included new red oak pews, and reconciliation rooms were built in the rear of the church to replace confessionals on the west wall. On September 14, 1980 Bishop Raphael Fliss, Bishop of Superior, offered the Centennial Mass of Celebration. In 1987 a new organ was installed. In 1993, the arch over the sanctuary was reconstructed at a cost of $40,000. In 1995 the last major changes and improvements were made. The purpose of the renovation was to provide for accessibility for all persons with disabilities, preserve the Gothic architecture and Catholic identity of the church, build a separate Eucharistic chapel and reconciliation chapel, install an elevator, enclose a new stairway, provide a larger gathering space, remove the choir loft and place the music ministry in front of the assembly, add two new classrooms and a nursery in the basement, provide handicapped-accessible restrooms near the entry in the basement, and provide four exits on each floor. The first Mass in this newly renovated church was held on June 2, 1995 with an all-school Mass. On August 27th of that year St. Joseph Church was rededicated. St. Joseph Parish has come a long way since the early days where the faithful traveled to the church by horseback, ox team, snowshoes or sleighs. However, the spirit of gathering as a community of the faithful is still very much alive. By 2010 this parish consisted of 967 families. In July 2014, St. Joseph Parish was clustered into a new cluster. This cluster consists of Holy Trinity, Our Lady of Lourdes, St. John the Evangelist and St. Joseph in Rice Lake. The cluster office is located at 111 West Marshall Street in Rice Lake.